It’s one thing for guys in the pretzel business to not know how to punctuate their name, but how, in the name of all the gods, does a sign maker not bother to check spelling, grammar and punctuation (since words are their job! ), and NOT correct someone spending all that money on a custom neon storefront sign? no one care's. 'eNJoy" punkchuashon and spelling mystaiks? Oh, this one made me cringe! I can say with only a minute amount of authority that if the sign company noticed this error, they probably couldn’t do much, if anything, about it. In the early 90s while teaching high school English, I was hired during the summer by a sign company to help with the rampant grammar/punctuation/spelling abuse on their signs. About half the clients really appreciated it when I pointed out potential errors; the other half seemed pretty resentful. Perhaps I wasn’t as tactful as I thought, or perhaps the clients were just dillholes. In any case, I’m sad to report that many signs containing errors continued to go out, much to the chagrin of the company that hired me. If I made signs, I wouldn’t correct them if they were wrong. I think it would be funny. But then again, wouldn’t I owe it to society to present correct grammar? I hate apostrophe abuse, however I would say that this fine establishment is owned by a Mr. Pretzel Boy. “Pretzel Boy’s” is simply showing ownership. Just because there are two Pretzel Boy’s doesn’t change that sense of ownership. I think this one can slide. PB — That’s what the original submitter’s investigation was about: there are TWO Pretzel Boys. When you see a restaurant named “Vincent’s”, it’s probably a restaurant run by a guy named Vincent. 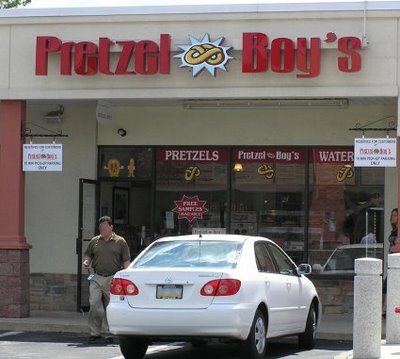 What is so wrong about a store run by a guy named Pretzel Boy? We have a local jewelry store called Diamond Brother’s. They’re aware of the apostrophe problem, but they weren’t at the time they incorporated, which means all their official materials must contain the misspelling. My guess is that we’re seeing something similar with “Pretzel Boy’s” here. Id hold off on blaming the signmakers; they’re generally constrained to produce what the client demands, regardless of grammar, punctuation, etc.